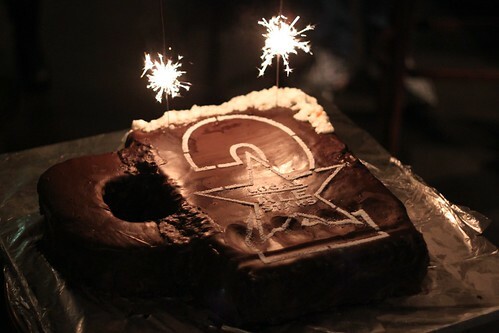 happy second birthday, Ale Stars! While Ale Stars was celebrating its second birthday, the French restaurant Embrasse in Carlton was having a dinner to introduce Melburnian diners to horsemeat. I really, really wanted to try horsemeat ever since my French friend Seb told me it’s actually pretty popular in France and other parts of Europe. Thanks to some death-threat jerks, Nic Poelaert (Embrasse’s chef) will not ever be serving it again. Claire of Melbourne Gastronome jokingly chastised me via the Twitters for attending a beer tasting in favour of sampling horsemeat (yes Claire, I am horrendously jealous but eagerly await your report! 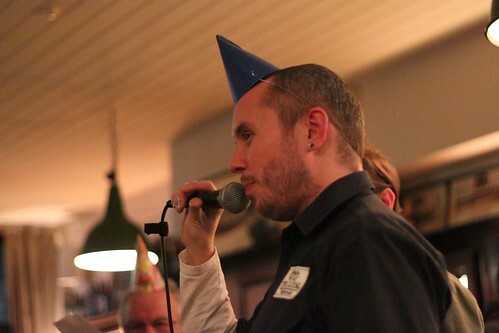 ), arguing that beer tastings were commonplace. Indeed perhaps now, but this wasn’t always the case. 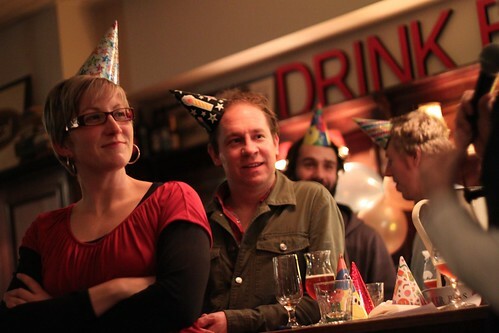 Two years ago, a group of eight people were assembled at a table for the first of what would become monthly beer tasting sessions at The Local Taphouse in St Kilda. Even in the short time I’ve been attending (since December last year), the sessions have grown in popularity. This was definitely evident on this particular evening. The Taphouse even managed to sign its fiftieth member! The large attendance may have had something to do with Richmond-based Mountain Goat Brewery coming along to help with the celebrations too. So not only did Barry sit down and chat to us about his story, he also brought some of his brew to share – the Two Champs Kolsch. It’s really inspiring to hear that the humble homebrewer can go pro (not himself but he cited examples of microbrewers who started off as homebrewers), if they want, provided they’re good enough! The kolsch originated in Cologne, Germany. This particular example of it is 4.7% ABV and good for a session of drinking. It had very little scent and was slightly bitter. It was supposed to be fruity but I couldn’t detect that (I was coming down with a cold, drat). Great beer to start the night with! Second beer of the evening was the Mountain Goat Dunkelweiss – a hefeweisen. The malt gives it chocolate characteristics and the esters give off the scent and taste of banana. Not my favourite for the evening – I think the weather needs to be hot for me to really enjoy wheat beer. Get the hint Melbourne and warm up a bit, eh? A lovely shot of the bar, courtesy of Tris. That’s glasses being filled for the benefit of the Ale Stars present. The beer could be one of two beers served, the next of which in our tasting was the Mountain Goat Richard III Doppelbock. 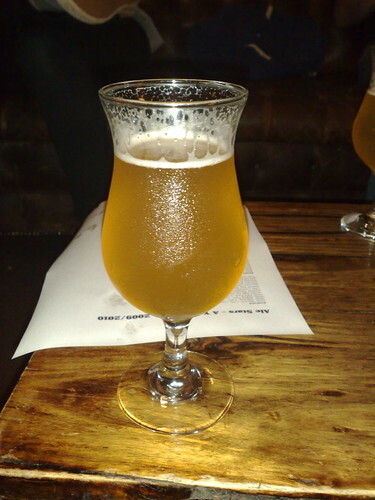 This beer was brewed in conjunction with Richard of the Wig and Pen Brewery in Canberra. The hops are there for structure and it’s largely a strong malty lager. Pretty alcoholic at 7.4% ABV with notes of caramel and toffee. YUM. This was probably my favourite for the evening. Though to be fair, comparing the last beer, the Double IPA, is really like comparing apples and oranges. It’s hop heaven, having Galaxy, Cascade and Riwaka hops. It’s also dry hopped. Despite having 65 IBU and having 2.5g of hop pellets and flowers per litre, it was sweet! 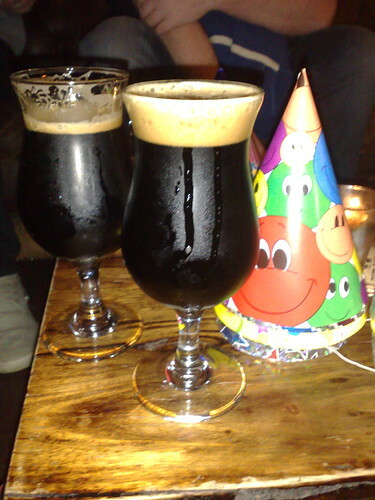 I couldn’t leave without trying the much fêted Heart of Darkness stout by Murray’s Brewing. Apparently, the head brewer has said that anyone who doesn’t like this beer is a dickhead. As far as I’m concerned, the fact that it harkens back to my modernist lit obsessive days and happens to be beer makes it a winner in my book. I’m not sure if it’s still available at the Taphouse, but you could also try sampling it at Beer Deluxe in the city. My friend Anthony had a glass of it with me and he’s not a big beer drinker and he seemed to really like it. Good thing, or he’d be a dickhead, haha. A fellow Ale Star introduced my mate Anthony to the concept of the ‘tweenie’ and we found ourselves with pints of Little Creatures brown ale. My enthusiasm for both the Little Creatures pale and bright ale has waned, but you know, the brown ale ain’t half bad! I don’t do really do the ‘Ale Stars is love’ posts quite as well as Prof Pilsner (whose report you can read here). Selfishly, my Ale Stars posts have always been about my personal beer journey – of learning and discovery. I owe so much of my education and curiosity to Ale Stars sessions. So glad to be part of the family! This entry was posted in craft beer goodness and tagged Ale Stars, Barry Cranston, beer tasting, craft beer goodness, Embrasse restaurant, horsemeat, Little Creatures brown ale, Melbourne, Mountain Goat Brewery, Mountain Goat Double IPA, Mountain Goat Dunkelweiss, Mountain Goat Richard III Doppelbock, Murrays Brewing Heart of Darkness, Nic Poelaert, St Kilda, The Local Taphouse, Two Champs Kolsch on August 6, 2010 by gem. Nice report Gem and it’s good to know that all aspects of the Ale Stars experience are being covered! I used to do the Beer Review style of post and just kinda leaned towards the ‘beer culture’ angle by accident. You might be pleased to hear that Nic Poelaert was named Chef of the Year at the Restaurant & Catering Awards on Monday night and Embrasse hooked best European Restaurant as well. Personally. 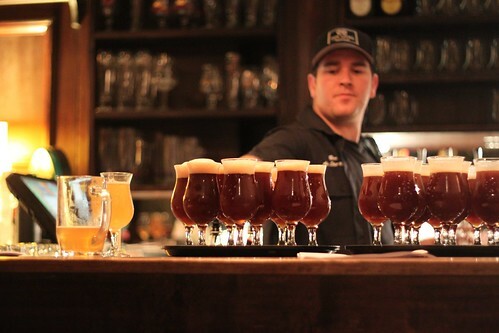 I’d like to see a Beer Dinner with horse matched to some appropriate beers – Ben’s Chevalier range, perhaps? Hmm? Or Flying Horse? Since getting more into beer in the last 12-24 months my perception of beer has changed from it being a mere social lubricant or something to get ‘pissed’ on, to something quite sophisticated and ‘deep’ :p.
It’s for that exact reason that it is great to see such varied coverage on it, especially by bloggers; with analysis on the industry, beer reviews and ‘beer culture’ coverage, there’s always something new and interesting to discovery. Isn’t the beer braised horsemeat something! We may have to fly to Perth for such culinary privileges. You know I’m a fan Prof – I did most enjoy your last Ale Stars post and meant it – I don’t do justice to the atmosphere that makes me feel like I’ve walked in to a pub and everyone knows your face! Yeah, I saw the announcement on Twitter would you believe (great you’re on it too btw) about Nic. Haven’t visited his establishment but on my wishlist as I’ve heard fab things. Ooh wow, can you imagine what a beer-and-horse matched dinner could be like? It’d also be a fantastic (though sadly controversial) way to raise beer’s profile as a beverage to enjoy with fine food.